Celebrating over 45 years of serving our community. Family owned since 1973. Norfolk Transmission & Muffler welcomes you to our automatic transmission repair shop website. Each transmission technician at our shop is highly qualified and ready to deliver their expert automotive transmission repair technician knowledge & skills for your every automatic transmission repair need. Norfolk Transmission & Muffler pledges to all of our customers that we will not remove a transmission from a vehicle in order to complete a repair unless absolutely necessary. Additionally our shop promises to diagnose transmission problems for all of our local and surrounding area customers in an honest and expert manner. Our shop strives to provide prompt and courteous service to all who visit our automotive transmission repair facility in the hope that you will come back to us for all of your automotive automatic transmission repair needs. The # 1 reason is: Norfolk Transmission cares about our customers!!! We know that your priority is to have a properly operating vehicle to take you to work or kids to practices etc. You may even depend on your vehicle for work. So we will do our very best to get your vehicle back to you in a timely manner and do it right the first time. We will do whatever it takes be sure you are completely satisfied with your experience. Our commitment is to our #1 resource, our customers. Norfolk Transmission’s employees know that they need to grow customers to enjoy a long and prosperous career. 2. Norfolk Transmission’s automatic transmissions are dynamometer pre-tested on one of our two dynos to provide you with a transmission that will work right the first time and it will pass stringent testing to insure long lasting performance. 3. Norfolk Transmission’s automatic transmissions are warranted 3 years or 100,000 miles with a nationwide warranty giving you peace of mind that you will be taken care of wherever you are. Other warranties are available depending on your needs. 4. We offer a Targeted Repair Warranty. Over 60% of the vehicles we check out do not need a complete transmission rebuild or replacement. If we can repair your transmission we will give you a Targeted Repair Warranty. See us for details. 6. 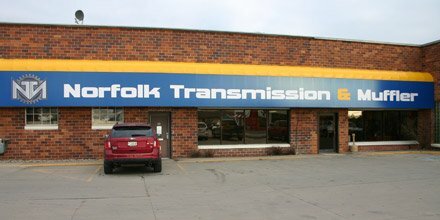 Norfolk Transmission’s technicians average close to 18 years experience and take continuing education through-out the year. Norfolk Transmission also sees to it that they are certified and tested to keep up to date on the latest systems and technology. Good to see there are still some honest people out there who work on cars. Even though I was having problems in the middle of a drive from Utah to ND, NTM didn't take advantage of me. I've been doing business with Norfolk Transmission for more years than either Ron or I would ever admit to. My faith in Norfolk Transmission has never been broken. A more honest business I've never known. Thanx Ron and Gang, it's nice to know there are still people we can trust out there. Keep up the good work!